As we move into 2018 the Irish public are happier than at any time since 2011, with just 1 in 10 asked claiming they are unhappy. The results from a study completed by RED C as part of a worldwide survey conducted by WIN Network and Gallup International, show that the Irish “Net Happiness” (those happy minus those unhappy) stands at over 50%, with the biggest increases in happiness seen among more upmarket groups and those in what has been described as the squeezed middle ages of 35-44. 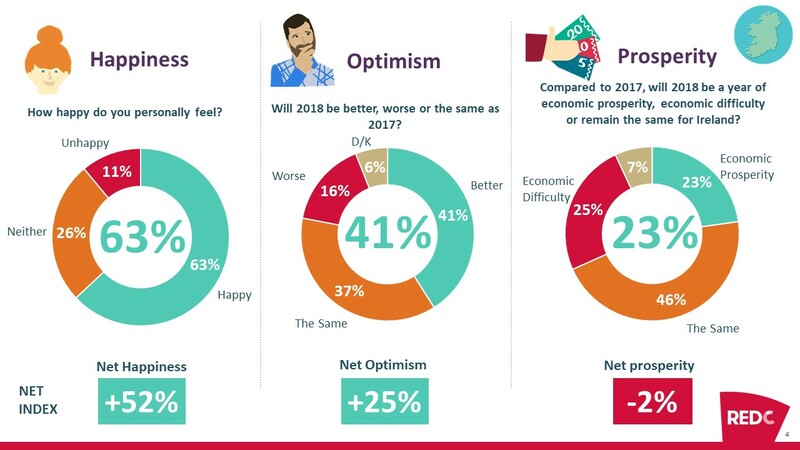 Optimism for the year ahead is also relatively strong with 2 in 5 believing 2018 will be better than 2017, and a similar proportion believing it will at least be the same as 2017. Just 16% think that 2018 will be worse than this year. Those in younger age groups are the most optimistic, with almost two thirds of all 25-34 year olds stating they believe 2018 will be a better year. However, the public are far more cautious when measuring likely prosperity in 2018. Despite being happy, and many thinking next year will be better, a much smaller proportion feel that 2018 will be more prosperous than this year. In fact, 1 in 4 adults think that 2018 will be a year of economic difficulty when compared to 2017, perhaps cautious of what impact Brexit may have on the economy. The Net Prosperity Index has improved somewhat since last year, but remains a long way behind that seen in 2015 when expectations were perhaps more unrealistic of the possible benefits of moving out of recession. 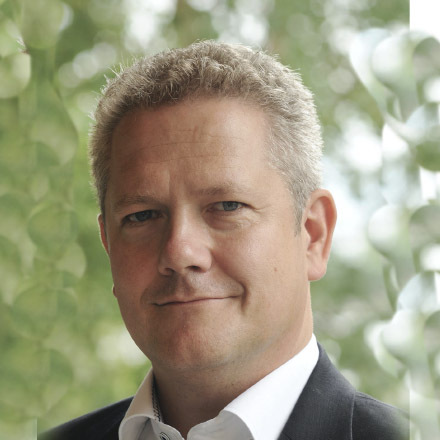 As such this year the public’s view on possible prosperity is perhaps more circumspect, having been somewhat led by false expectations in the past. Ireland ranks 19th in terms of happiness among the countries covered in the survey, with Fiji, Columbia, Philippines and Mexico all seeing very high levels of happiness across their populations. European citizens are generally less happy than many other countries. 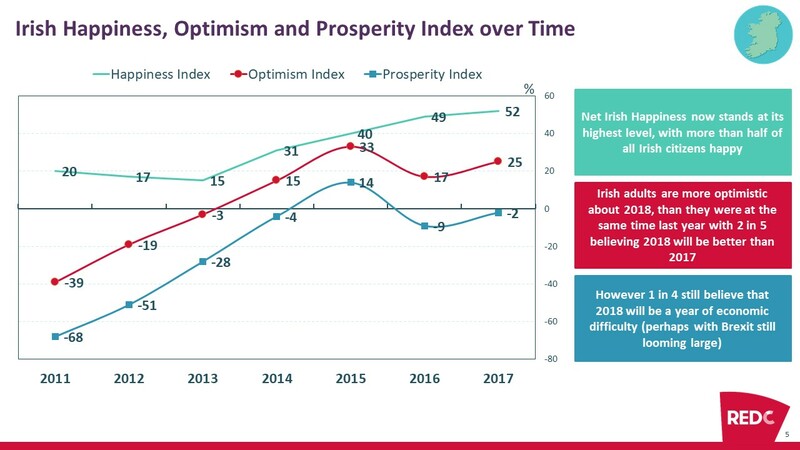 Optimism is highest in Indonesia, Nigeria and Fiji, but Ireland is in the second quartile of countries worldwide in terms of optimism. Several other European counties citizens are pessimistic for the year ahead, with the EU countries of Greece and Italy a particular concern as citizens of both countries appear to be pessimistic about 2018 and believe that they will be less prosperous next year. The UK population also has quite low expectations in terms of their economic prosperity in 2018, with the third lowest net prosperity index in the world among those countries covered by the survey. However this hasn’t declined substantially since last year, suggesting any impact of Brexit has been at least in line with concerns.